In spite of my intrepid drive to experience the diverse and incredible landscapes of the Pacific Northwest, the Painted Hills were one of the 7 Wonders of Oregon that I had yet to see. And to be honest, I wasn’t sure what to expect. I’d seen many striking photos, and as with other beautiful photos of amazing landscapes, I wondered if it would be that scenic in person. The drive from Portland begins with a drive to Mt. Hood and its familiar forest greenery. But once you leave the Mt. Hood area, the landscape changes quickly as you cross into the eastern Cascades and enter the Warm Springs Indian Reservation. Flattening out in various shades of brown with a startling absence of the taller conifers, the landscape is so dramatically different along Highway 26 that it seems like it should be another state altogether. Small shrubs line the road as it changes to a dry and open expanse. High plateaus surround a wide gorge as the highway begins a slow descent towards the town of Warm Springs and the Deschutes River, and upon reaching it, begins to climb back up to the plateau level again. Continuing south, the towering Cascades line the western sky, with big views of Mt. Jefferson, showing a different face on its eastern side. The town of Madras is where the highway turns east towards Prineville and goes through the Crooked River National Grasslands. Heading farther east, the landscape begins to change again as it approaches Prineville, the largest town we’ll go through on this trip. Prineville looks like an old frontier town with a tidy downtown and a stately county courthouse. A stop at Tastee Treet for old-fashioned hamburgers, fresh cut fries and milkshakes is highly recommended. 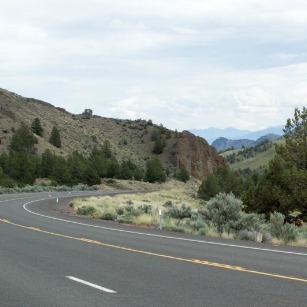 After Prineville, the drive heads into the Ochoco Mountains. This area has a look reminicent of the wild west we’ve seen in books and movies, with brownish foothills and small mountains with forests of Ponderosa pines. Our campground, Ochoco Divide, is located right off the highway near the summit of the Ochoco mountains. 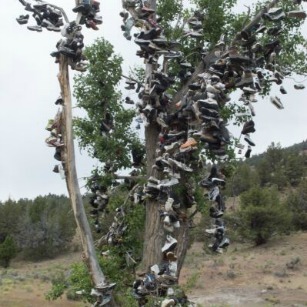 Set in a pretty stand of old growth Ponderosa pines, the campground has spacious campsites, a camp host with firewood, and cleanly kept vault toilets. A wildfire in July 2014 burned a few trees in the campground, but not so many that it changed the overall feel of the forest here. 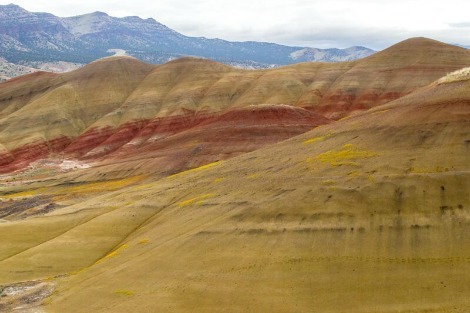 The Painted Hills are about 25 minutes from the campground, heading north and east on Highway 26. On our early morning drive to see the sunrise over the hills, we saw elk and antelope. 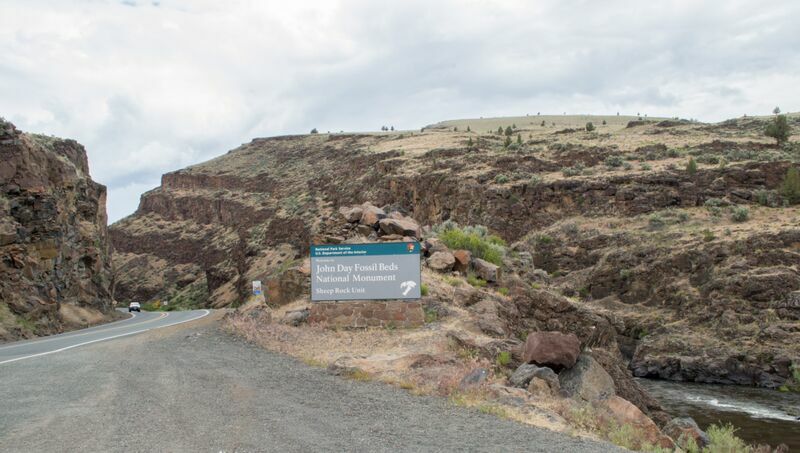 A sign for the John Day Fossil Beds National Monument’s Painted Hills Unit directs you to turn off the main highway at Burnt Ranch Road for another 6 miles. There is no visitor’s center here, but there are restrooms and picnic tables. We went to the main overlook area to take in the views while the sun came up. The colors of the hills are muted and soft in the early morning. The hills are large rounded mounds of clay soils with bands of color running through them. 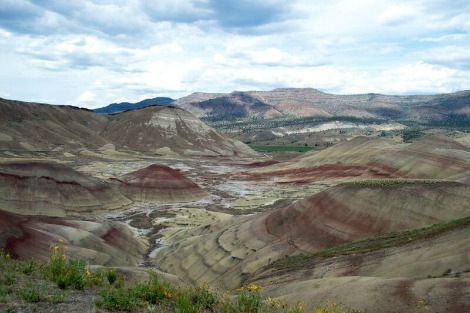 The overlook area has the most of these formations, with a ridge line surrounded by smaller cone-shaped mounds. Most of the hills are a tannish to mustard yellow color, with bands of red and streaks of black running through them. 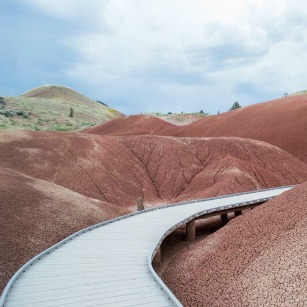 There are several short trails in the Painted Hills, including the 1/2 mile Overlook Trail that is the main attraction here. We also visited the Painted Cove, with a boardwalk that takes you through several smaller mounds of red and yellow-hued hills. 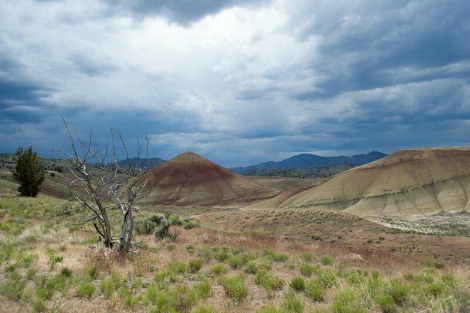 The Sheep Rock unit is located about an hour’s drive east of the Painted Hills, also accessed via Highway 26. 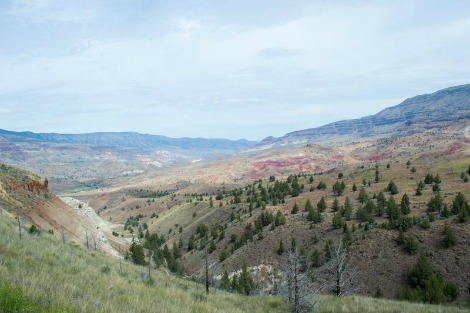 On the drive, the landscape changes yet again and just before the turnoff for Sheep Rock, enters a gorge with high rocky cliffs on both sides of the road. 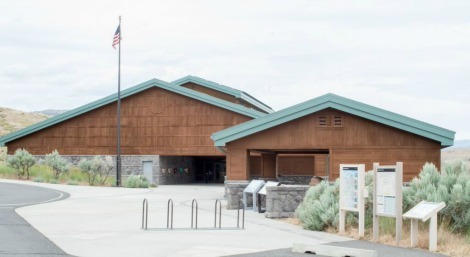 Our first stop was the Thomas Condon Paleontology Center, a large building with interpretive displays about the history of the area, a small gift shop, and a ranger station. Sheep Rock dominates the views around the center, towering over the surrounding hills. Inside the visitor’s center, we learned about the history of the area, including the types of animals that used to live in this area when it was a subtropical forest. Watching the film in the theater at the center, we learned about how the geological features were formed, but also that this area is home to a vast number of unique fossils that span 40 million years and provide unparalleled records of the Age of Mammals not found elsewhere in the world. A noted paleontologist, Dr. Ralph W. Chaney stated “No region in the world shows a more complete sequence of Tertiary land populations, both plant and animal, than the John Day Basin.” After our visit at the center, we stopped at the Historic Cant Ranch, with picnic tables and a renovated home built in 1917 by Scottish immigrants. While the Sheep Rock unit has several trails for hiking, the highlight of our trip was the Blue Basin Trail (3.25 mile loop with 800 ft. elevation gain). The trail skirts the north side of the Blue Basin, then loops around and begins a steep ascent through a narrow canyon. 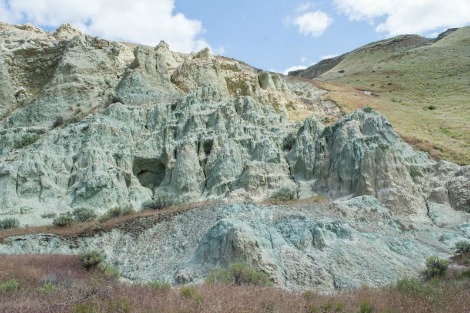 Along the way, minty blue-green rocky formations in the hillside sharply contrast with the surrounding landscape. The greenish chalky color even penetrates the water in a small outlet stream. 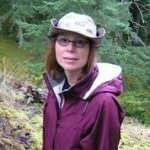 Juniper trees and sage shrubs dot the hills as you hike your way up. A boardwalk section near the top leads to a bench and panoramic views, with differing shapes and colors of hills and mountains surrounding the basin. Down in a narrow valley, the John Day river winds its way through flat green fields. At the top of the basin, the trail rounds the sloping hills, with a side trail to an overlook with more views. Continuing on the trail, a short section goes through private land divided with fencing and gates to walk through. Back on national park service land, switchbacks eventually lead back to the trailhead. Just before the loop ends, the Island in Time trail crosses the trail to the right. This trail takes you into the heart of the other-worldly blue-green formations. Although only 1.3 miles roundtrip, there are 13 grated-surface bridges along this trail, making it difficult on a dog’s paws, so it’s recommended to not take dogs unless you can carry them across the bridges. 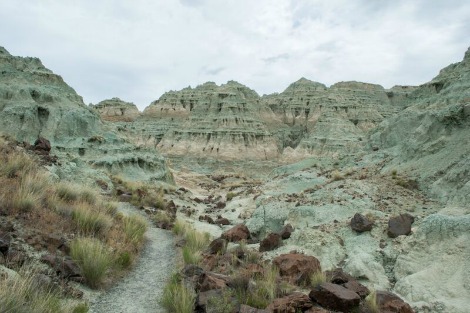 Winding through the heaviest concentration of these blue-green formations, with interpretive panels and replicas of fossils spaced throughout, you are completely surrounded by this surreal landscape at the end of the trail. Not knowing what to expect before I visited these unique areas in Oregon, I came away with a new appreciation for their rich geological histories and vastly diverse landscapes. The beautiful images of these areas I had seen in photos were even more stunning in person.